Two immortal factions have been at war without any result. They decide to draw a truce and leave it to their selected mortal champions to battle it out. April Fall and Kyle Brown find themselves selected and possessing control over fire and water. They must fight as a pair in order to save the world and themselves. So when they happen upon Kyle and Kim, they realise that the time could be sooner than ever. Except their chances of survival are much more slimmer than they thought. This was one of the most interesting and unique concepts I've ever reading YA Fantasy. Charlotte Jain takes on Greek Mythology with a modern twist, although I didn't realise that whilst I was reading the plot description. What drew me in were the elements at war and how two teenagers hold the responsibility to fight an immortal war. Despite my initial interest, I found my reading experience to be marred by confusion. The book switches between April and Kyle's perspective, but I found it difficult to distinguish between their voices. The chapter titles didn't indicate the change in views as well so I would find myself feeling lost. I do understand that it is an ARC though, so the errors haven't been finalised and things might not be as clear as the finale should be. It's just I would've like to maybe read it without stopping and starting every single chapter. I think I'm part of the tiny minority, but my one issue with was how slow the first half was - and maybe that was due to the choppy reading. I really had to push through, and I just couldn't grasp everything properly. However, once I hit the second half the action took place and everything just meshed together really well. It built up towards the point of the battle and the cliffhanger does make me curious to see what the sequel will bring. I didn't love the characters, although I liked the sense of depth that they had - more so April. She shouldered her responsibility despite her past. I still couldn't figure out some of their moments or what their characters were suppose to do, but I guess I could piece it together. 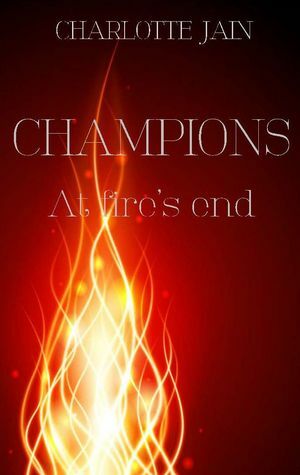 Champions: At Fire's End was definitely an interesting read with a unique concept, placing it under a spotlight. I can see that on the Goodreads community it's received very positive feedback, and personally I think it's definitely worth a look at it.